The Special Marshals are the volunteer arm of the Federal Road Safety Corps. This volunteer arm was created by the same FRSC statute Sec. 10 (1)… “the Corps” which shall consist of such number of uniform and non-uniform members as may be determined, from time to time, by the Commission. 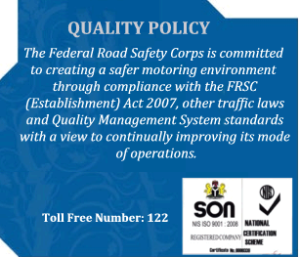 FRSC Establishment Act (2007). They are men and women of means, with proven integrity in society, and able to influence their immediate environment (work place/community) in favor of the course of road safety. The Act empowers the Special Marshals to carry out patrol and other activities that ensure good road usage on our highways. Just like their Regular counterparts, they can arrest and book traffic offenders as well as prosecute them when necessary. The Special Marshals are administered by a Department headed by an Assistant Corps Marshal (ACM). The department is called Special Marshals and Partnership. The Unit Command is the grass root level of the Commission. Special Marshals at this level are coordinated by a Special Marshals Unit Coordinator who is responsible to the Unit Commander. Like any other level, there could be more than one Special Marshals Unit in the Command with at least fifteen members in each Unit. At the Sector level, the Special Marshals are coordinated by the State Coordinator who is responsible to the Sector Commander. The jurisdiction of the State Coordinator covers all the Special Marshals at the Unit and State levels. Some Zonal Commands have two or three states while some have four. The Special Marshals in each zone are coordinated by a Zonal Coordinator who is responsible to the Zonal Commanding Officer. There are no Zonal Special Marshals, the Commanding officer administers the Special Marshals through the respective Heads of Special Marshals in the Command. This is the Management body of the Special Marshals, at the National Level, the Special Marshals are headed by the National Coordinator who is responsible to the ACM (SM). He oversees the affairs of the Special Marshals at the National Level. He liaises between the Special Marshals and the Management of the Corps. The National Executive Council (NEC) is made up of 15 members: the National Coordinator, 12 Zonal Coordinators are members and 2 ex officio (who are past National Coordinators). They also vie and hold the under listed Six offices. The NEC holds meeting biannually with the Corps Marshal presiding and the ACM SMP, ACM Operations, Corps Intelligence Officer, Personal Staff Officer to COMACE in attendance. The strength of Special Marshals currently stands at 13,053 in all the 12 Zones. In 1996, over 15,000 members of Special Marshals were registered nationwide, shortly after then the management deemed it necessary to prune down the number to a manageable figure of 8000. In 2001 there was pressure from the National Executive Committee of the Special Marshals for increase. The Management approval increase the numbers of members to its current figure of 13, 053. Management has approved the increase of more members to 30,000 by 2012. With this approval, membership of Special Marshals is to be spread across the country to the grassroots and to include all profession. Monitor road users and Road Marshals with a view to providing constructive feedback to the Commission. Patrol the highways and control traffic on group basis. Participate in research activities relevant to road safety. Organize, sponsor or participate in workshops, public enlightenment programmers and Road Safety Campaigns. Organize and encourage Road Safety Clubs. Any other function as may be assigned from time to time by the Corps Marshal and Chief Executive (COMACE). This is conferred only on Executive governors of State as Patron of Special Marshals and can be performed only by Corps Marshal and Chief Executive. Some very important, highly placed individuals have honourary Special Marshals conferred on them due to their notable and outstanding contribution to safety on our roads. Such individuals do not need to apply, their contributions/position determines their eligibility..
Every state has three (3) slots for Honourary Special Marshals in a year. Special Marshals go out on patrols in groups on the days agreed by them. The take off point of patrols must be the Command office where they are issued with the Notice of Offence booklets and routes to cover. Special Marshals can book offenders and even prosecute. But emphasis on their patrol activities is on public enlightenment. Special Marshals organize annual programmes to create more awareness and enlightenment; among themselves, to increase their effectiveness and build their capacity. This is an annual event organized by Special Marshals at the state level. Special Marshals in each state plan and execute this programme with the support of the Command. Some of the common events of the workshops are public enlightenment, presentation of papers on relevant issues concerning their activities. This is held during the 3rd Quarter of the year. Conferences are held at the Zonal level. Here, Special Marshals from the component states that make up the Zone come together. Conference papers based on the selected theme are presented by eminent personalities from within or outside the Corps. This is a national event for Special Marshals that is held during the 4th Quarter of the year. It involves looking at the activities of the past year and brainstorm to chart a course of action for better performance or introduction of new concept for better service delivery in the coming year. Corps Marshal and chief Executive attend, though he can delegate where he is unable to attend. and management of the activities of Special Marshals. These annual events are opened to sponsorship. All Special Marshals must be kitted with the prescribed regalia and identity cards. The regalia is blue with reflective ape/material by the side and round the middle. It has a face cap with an arm band. The arm band and uniform carry the personal identification number of each Special Marshal. In the event of any Special Marshal leaving the outfit, he/she must surrender his kits and ID card to the Commanding Officer. If the Kit or ID card is lost or stolen, the Special Marshal has to make out an affidavit and apply to RSHQ for a replacement. Guidelines Code of Conduct has been produced to guide and regulate the activities of the Special Marshals. Similar guideline code of conduct also exists for the Road Safety Clubs. industry, celebrities etc are all involved in Special Marshals activities. By their numbers, the Special Marshals have adequately complemented the efforts of the Regular Marshals, especially in the areas of patrol operations, traffic control, public enlightenment etc. The Special Marshals have also made tangible contributions to the operation of the Corps through donation of vehicles and other patrol equipment, as well as sponsorship of public enlightenment programmes of the Corps. The Special Marshals serve as image makers for the Corps through advocacy. by him while on duty on the route to which he is assigned. 1. Increase the numerical strength of the Special Marshalsto ensure spread of road safety activities to all corners of the country. Getting Special Marshals to be more active, increasing their current number. 2. Lack of funds/sponsorship to energize Road Safety Clubs through quiz/debates and Road Safety talks. More attention is being given to the Road Safety Clubs. To ensure that through the right information the new generation of Nigerians will be better road users thereby reducing to the barest minimum the ugly carnages prevalent on our highways at present.